When it comes to sequels, however, their track record is spottier, but there is a valid explanation/excuse for that; while they were involved with “Cloudy with a Chance of Meatballs 2” (story) and “22 Jump Street” (directors), the scripts were written by other people. “The LEGO Movie 2: The Second Part” is the first time that Lord and Miller have written a script to one of their previous directorial efforts, but the end result, while better than the aforementioned sequels, is also a little off. It’s the kind of film that is going to reveal layer after layer of in-jokes and pop culture references with repeat viewings (seriously, the jokes come by the truckload), but at the same time is a bit too familiar. Like “22 Jump Street,” “LEGO Movie 2” shares a bit too much DNA with its predecessor. Picking up right where “The LEGO Movie” ends, the visitors from Planet Duplo are greeted with hostility by the residents of Bricksburg after a peace offering is rebuffed, and war ensues. Fast-forward five years (the exact time between the “LEGO” films), and Bricksburg is now an apocalyptic hellscape. 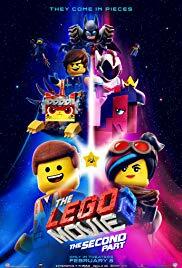 Emmet (Chris Pratt) is trying to build a normal life with girlfriend Lucy, formerly known as Wyldstyle (Elizabeth Banks), but the town is attacked by a different, non-Duplo group of alien invaders who kidnap Lucy, Batman (Will Arnett), Unikitty (Alison Brie), Benny (Charlie Day), and MetalBeard (Nick Offerman), and take them into the unknown reaches of space. (Actually, it is known, but spoilers.) Emmet attempts to rescue them, and is saved from doom by Rex Dangervest (also Pratt), an all-purpose macho dude. Emmet’s friends are delivered to Queen Waterva Wa’Nabi (Tiffany Haddish), who’s planning a mysterious wedding ceremony that both Emmet and Lucy are determined to stop. There is an electronic band called 808 State who had some success in the early ‘90s. They liked to do a thing called silhouetting, where they take an existing song of theirs, add a bunch of new riffs and drum tracks on top of the old ones, remove the original bits, and voila, they have a new song. The script for “LEGO Movie 2” feels like a silhouetted 808 song. Both are cool, but it’s hard to overlook the similarities. While they were able to keep certain aspects of the story a mystery until the very end, most of it was out in the open from the very beginning. This is where the pop culture references kick in, to distract the viewer from the sense of deja vu. The names of Rex’s velociraptors comes to mind. On the plus side, the movie pulls a trick similar to the one Jason Segel pulled in his script for “The Muppets” and basically shames the audience for its inherent cynicism concerning a major plot point. In addition to that, the movie takes direct aim at the concept of toxic masculinity (while also having fun at the expense of their lead actor who subsequently became an action hero). Yes, Rex Dangervest is tough, and macho, and cool, but is he the best version of himself? The movie makes it quite clear that he is not. Also, this is a musical. Unlike the first “LEGO Movie,” which leaned upon “Everything Is Awesome” from start to finish, there are a number of musical highlights here, starting with “Catchy Song” (it’s ridiculously catchy) but it also contains a hilarious villain number by Wa’Nabi (“Not Evil”) and a melancholy reprise of “Everything Is Awesome.” The best songs, though, are in the credits. Beck (with The Lonely Island and Robyn), Matt & Kim, and Superorganism all play over the credits, and I only know this because I stupidly waited through the credits for a stinger that never came, so learn from my mistake: skip the credits, buy the soundtrack. “The LEGO Movie 2: The Second Part” is an extremely difficult movie to break down on a five-star scale. The story’s tendency to repeat the original script to the beat, all the way down to the real-world bits flashing before the viewer in a disorienting manner and without context, is frustrating in its sameness, but at the same time it tackles some difficult topics. In addition to the bro stuff, the film analyzes the role that age plays on sibling dynamics, and while it’s doing those things, it’s bringing a boatload of funny at the same time. If this sequel has a spiritual partner, believe it or not, it’s “Deadpool 2.” Both had, and lost, the element of surprise with their respective sequels. That doesn’t mean that the sequels are bad; it just means that they’re less surprising.